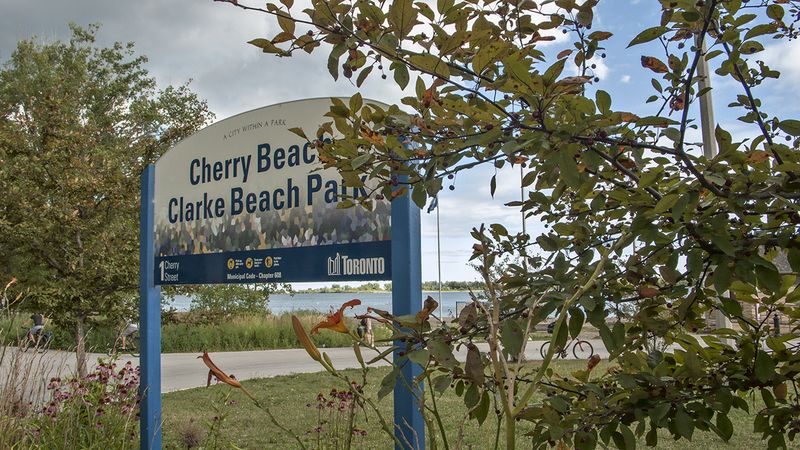 We are charmed to see tiny cherries on the trees at Cherry Beach. There is a major aerial presence here – Cherry Beach is directly on the flight path of the Island airport, and low-flying planes pass over at frequent intervals. It has a gritty, blowsy feel to it, less groomed with large trees and stony pathways. This is Toronto’s rockiest beach. The rocks are slippery and much larger than the pebbles at other beaches. They continue all the way out, no sandy spots for relief. The most treacherous footing we encountered. Painful. The strategy going in was to slowly pick our way to knee depth and then flop onto our stomach and, as the lifeguard advised, “sort of scull your way out.” A friend on shore tossed us our rubber sandals as we came in. Footwear mitigates the pain, but without a personal valet it would have to float beside you while you swim. Could see my feet straight down, though the water had a greenish cast. These lifeguards station themselves just beyond the buoys and stay put, watching benignly over swimmers without making their presence felt. Perhaps they have more confidence in the competence of swimmers since many tri-athletes train there. The Leslie St. spit is directly opposite, and its treeline encloses the eastern swimming area. Open water on the western end. The beach is lined with shade trees, and the CN Tower is only visible from the Cherry St. bridge. Huge fenced off-leash park with mature shade trees. Many jumping dogs enjoying the space. Beautiful though unpleasantly aromatic. In fact the whole beach was smelly; hot grease from a poutine truck was the dominant scent note.